I recently changed jobs, and in the process traded a consistent 30-minute commute for a nail-biting daily adventure into downtown Atlanta. Here’s a clue about my new work destination. It’s also now an all-too familiar view out of my windshield. Commuting is not a remarkable activity in and of itself. It is a necessary evil for those of us with kids, living the suburban “dream.” And, unfortunately, it is one of those activities that characterizes life in the New South — at least the urban New South. 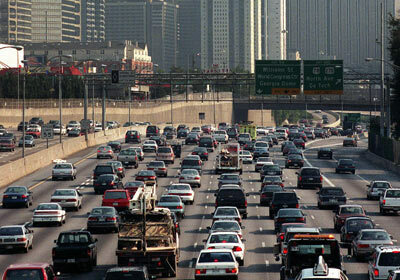 According to the U.S. Census, Atlanta has the sixth longest commute time — an average of 30.3 minutes — in the U.S., behind such undrivable places as New York City; Washington, D.C.; Chicago and Los Angeles. I’ve found that I fall right into that average, depending on what time I leave my house in the morning and the office in the afternoon. Way back in 2008, Forbes magazine did a piece on the worst cities in America for commuters. No surprise to anyone who has ever been stuck on one of Atlanta’s “thoroughfares,” Atlanta ranked no. 1 on the list of worst cities for commuters. The reasons? Back then, Atlanta was the fastest growing city in America, and infrastructure improvements could not keep up with growth. Also, the public transit system does not reach out into the suburbs sufficiently to be a convenient alternative to driving. The growth and urban sprawl conspire to put more people behind the wheel because there is simply no alternative. My new commute is 23.7 miles, one way. If I leave the house in the vicinity of 7 a.m., it’s at least 45 minutes. If I leave before 6:30 a.m., it’s a half hour. This is a no brainer. I’ve latched onto a schedule that has me leaving the house at 5 a.m. (I’m up at this time any way) and arriving at the gym near my office when it opens at 5:30 a.m. That puts me behind my desk and ready to work at 7 a.m., without the stress of fighting traffic. The afternoon has been a more difficult puzzle to solve. If I leave between 4 and 4:30 p.m., my commute is about 45 minutes. Departing the office anywhere near 5 p.m., and it’s upwards of an hour. I’ve tried multiple routes already, but the only sure-fire solution is to hit the door before 4:30 p.m.
What a difference 100 years make. 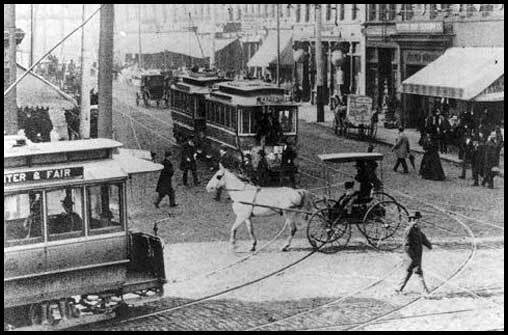 This is Peachtree Street, circa the turn of the last century. Now that’s a commute! 1. Time is our most precious resource. Money can’t buy happiness, nor can it give you back the time you spend in your car. Time is a zero sum game. The more time I am in the car in the afternoon, the less time I am spending with my boys or talking to my wife. 2. Transportation must be functional. I used to want a pickup truck. Not anymore. Now I want to replace my 2001 Volvo V70 wagon with the most fuel-efficient car on the market. I’d even drive one of those solar-panelled, sailboat-looking things if it was reliable. 3. Sleep deprivation is deadly. My wife says I don’t get enough sleep. Well, if she is correct, then I need to make some changes. Tooling down the back roads of Gwinnett County while in need of some shut-eye will get you into a ditch. Nodding off while fighting the hordes on the Connector or I-85 will get you killed. 4. Mental health is on the line. Nothing tests your true state of mind like a commute. If you are calm and at peace, it’s no big deal. You’re willing to let someone cut in, you drive safely and patiently, and you make it to your destination in one piece. If you are already amped up before you get behind the wheel, look out world! Road rage will spill over onto your co-workers or family. Serenity now! 5. The Golden Rule applies. Hey, we’re all just people out there trying to get where we’re going. It’s not a race. The most basic of all rules governing human interactions can save lives during a commute — or at least save your sanity. See you on the highways! Do you have an awful commute or are just minutes away from the office? How do you cope with commuting? Share your pain or brag by leaving a comment below. This entry was posted in Uncategorized and tagged children, commute, Commuter Dude, commuting, contemporary South, driving, family, I-85, Lance Elliott Wallace, Lance Wallace, Lilburn, New South, New South Essays, NewSouth, parenting, relationships, South, Southern, Southern Culture, Southern Living, Southerners, the Connector, the South, traffic. Bookmark the permalink. All I have to say is thank goodness for NPR and my travel coffee mug – my communting salvation. Let me kow if you want to carpool – even though I do not drive a solar sailboat. I leave at 6:15am-ish and 3pm on the dot-ish. Congrats on the new job!!! I’m praying for your safety and hope you get away everyday around 4ish. Yes, Atlanta is BAD for traffic. I well remember a shift in perspective for me that took place in the 90’s. I had a customer who sent me to Los Angeles several times. I faced it with utter dread. But by the second trip it dawned one…. LA is BETTER. Welcome to the commute! Everything has trade offs, doesn’t it? You think you don’t have enough sleep now? Do this for another 5 years then tell us what you do on Sunday afternoons in your recliner! Btw, you love gas mileage hybrids in bumper to bumper traffic. Hope all else is going well. God help us all when it rains. It took me an hour to make my normal 20-min commute this morning.